Click here for the monthly newsletter. The past few months have been extraordinary. I suspect that nobody on this committee quite anticipated the intensity of the work. And there’s more to come. But I think I speak for all of us that in saying that it has been a deeply joyous process, and that we’re honored and humbled to be serving in this way. Over and over again, the committee has invoked the First Church covenant. Asking what the words mean, and what kind of minister we need to help us live it. Can we find a minister who is able to get more than a 90% vote on May 5th? The survey results and the cottage chats revealed variations on all of these themes. And it’s with this in mind that the search committee has reviewed prospective candidates. Twelve candidates expressed interest. That’s a lot. During January, each committee member spent somewhere around 60 hours in candidate review. Between those hours, we experienced ordinary life: new jobs, illness, serious family health crises, deaths of family and dear companions, human and furry. The term walking together has been ever present, like a beacon. We’ve felt the immediateness of walking with one another, and the ever-present covenant to walk with all of you. At this point, we’ve narrowed our field to two candidates, a man and a woman. They’re both sort of young -- probably between the age of 30 and 50. Each has considerable strengths, though in very different areas. Each spoke very thoughtfully about how they’d approach ministry here. They know we’ll expect them to move to Salem or a neighboring community, and are excited about that. During this process, we’ve learned some important things. We’ve learned that UU ministers generally preach between 35 and 40 Sundays a year, less often than we’re accustomed to. We’ve also learned that a Worship committee often actively partners with the minister to plan services. We’ve learned that churches often provide training for lay leadership. Perhaps it’s coaching for people who speak from the pulpit, or listening skills for people doing pastoral care. It might be facilitation skills for committee chairs. You get the idea. We’ve learned that it’s unusual to have a children’s moment every Sunday. And that it’s generally called A Time for All Ages. We’ve learned that UU ministers expect 4 weeks of study time each year to deepen their ministry. And that they’re expected to report back to their congregations about their learning. We’ve learned that First Church isn’t perfect. And neither is any minister. We walk together in all our splendor and imperfection. The search committee’s next step is to spend a weekend getting to know each of the two candidates. After those weekends, we will bring one candidate forward. That candidate will preach here on two Sundays: April 27 and May 5th. They’ll spend the week in between getting to know the church community. The congregation will then vote on May 5th to call (or not) its next minister. The committee is excited about this next phase. At this juncture we believe we have two excellent candidates each of whom is just as excited about First Church. We continue to be honored to serve the church in this way and encourage you to offer us your thoughts and ask your questions. 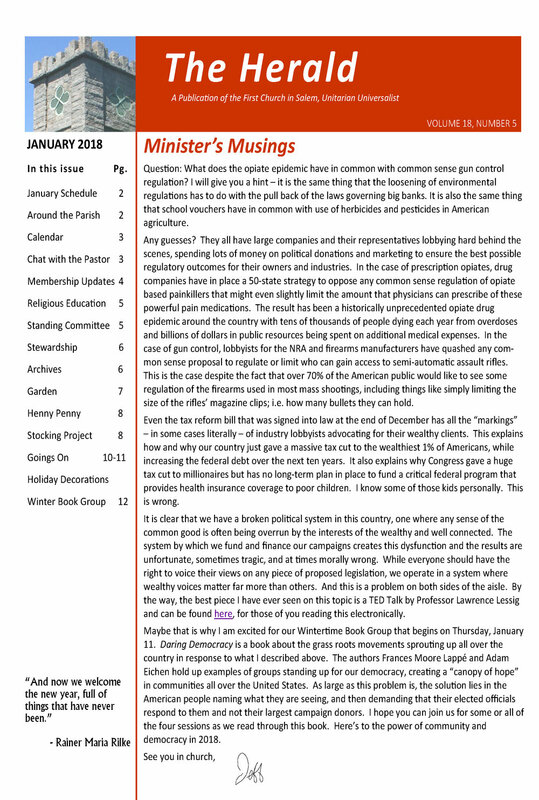 Click here for the December 2018 monthly newsletter. 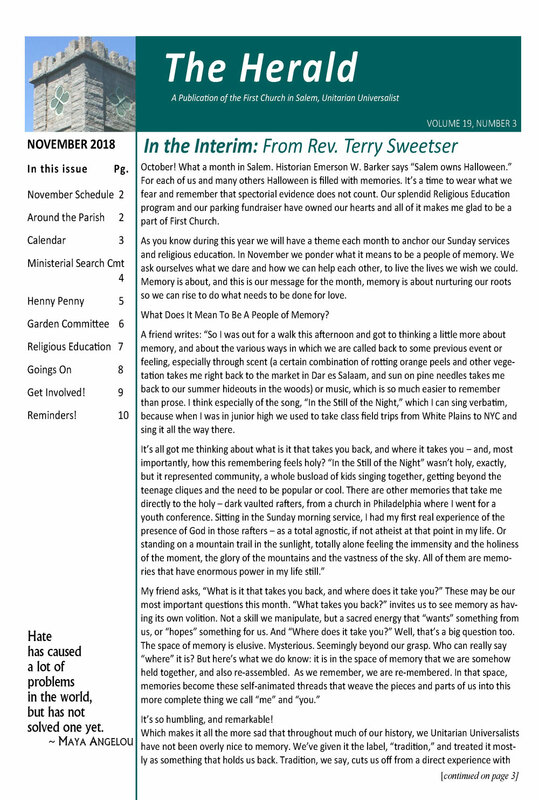 Click here for October 2018 Newsletter. Click here for the September 2018 Herald. Check out Ethics in Intelligence Operations on Youtube! The program from May 18, 2018 featuring former CIA Officer John Kiriakou: “Ethics in Intelligence Operations,” is now on the First Church’s YouTube Channel. Throughout history, and particularly today, the role of intelligence services in information collection and operational activity has been controversial. This talk explores both personal morality and the rule of law in these functions today. As I announced in my pulpit editorial on Sunday, June 3 the Standing Committee has hired an Interim Minister. Terry Sweetser is an accomplished minister with a great deal of experience working with UU churches in the Northeast. He will serve us for a year with the ability to extend for a second year. Reverend Sweetser will begin effective August 1st. He asked for the opportunity to send a note which you can read below. I’m honored and delighted to take up interim ministry among you during this period of ministerial transition. You have been faithfully and wonderfully served by Reverend Jeff for almost a generation. For him and for your congregation it’s a time of change, farewells, and new beginnings. Because of the work you and Reverend Jeff have done together First Church is vital, strong and balanced. You have spiritual depth, a passion for justice, and commitment to young people. Our task now is to find new ways to walk together with God. As we start our walk together I need to get to know you. Above all, I need to listen and learn. So, I will be spending time in August and September becoming immersed in the ways of First Church and Salem. If there is anything you think I should know plan to meet with me in August or email me any time terrysweetser1964@gmail.com. I come to you with forty-five years experience as a Unitarian Universalist minister. The church I grew up in, First Parish, Norwell (gathered in 1642), was not very different from First Church, Salem (gathered in 1629). We said the Lord’s Prayer and were inspired by scripture every week. I’m glad to be coming home to it. Please cherish the good-byes and hellos ahead. Click here for the June newsletter. Click here for the April Newsletter. 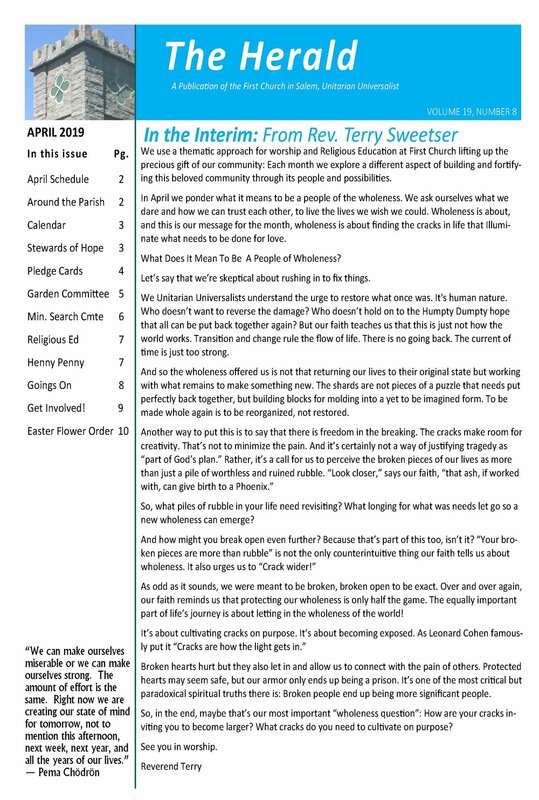 Click here for the 2018 February Herald. Click here for the January 2018 Herald. Click here for the December Herald. Click here for the November 2017 Herald. Click here for the October 2017 Herald.